Chennai/Mumbai: Why would someone go to a theatre at 5 am to watch a Rajinikanth movie? Because tickets were not available for the 4 am show. Chennai shut shop early on Thursday over worries on which way the Ayodhya verdict would swing, but now it seems it was only to queue up before daybreak for the first day, first show of Enthiran (Robot). Thousands jostled for an elusive ticket as theatres in Rajini city began screening the film on Friday before the crack of dawn. While the first show at the city’s Rakki Cinemas in Ambattur was at 4 am, it was at 5.45 am at the AGS Cinemas in Villivakkam and 6 am at Kasi Theatre. Even national exhibitors like PVR cinemas and Inox began shows in Chennai around 8 am. Bollywood took a backseat in Mumbai, as thousands of Rajini worshippers lined up outside Matunga’s Aurora theatre where prints of the film were finally brought after being taken to a temple in a chariot. Aurora owner Nambi Rajan has seen the frenzy before—the 68-year-old theatre has been screening Rajni films forever. “But what shocked me was this 76-year-old Iyer lady who turned up first day first show to watch her favourite superstar,’’ says Rajan. “Women coming to watch the film on day one is unheard of. To top that, I saw her again at the 6.30 pm show,’’ he adds. “He’s simply the best,’’ beamed Laxmi Iyer. Fans keen to celebrate the latest outing of their favourite Tamil actor were willing to go to any length. “I woke up at 2.45 am to reach the theatre well in time for the 4 am show,’’ said Chennai’s K Surya Kumar, 27, comparing the experience to a pilgrimage. Others travelled even longer distances to catch the sci-fi extravaganza, billed as the most expensive film ever made in India. Arvind Akshay, 25, an acquisitions manager with Citibank in Bangalore, came in to watch it, in the land of Rajini at Chennai’s Albert theatre, which he claims is the ‘mecca’ of Rajini fans. Akshay is planning to watch the film 12 times in two days. 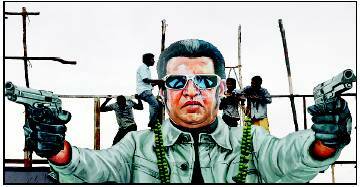 Reports also came in of Rajini fans flying down from Mumbai to Chennai to catch the film. Dr S Natarajan, one of Mumbai’s busiest eye surgeons, took a break from his schedule to watch the film. “I am a huge Rajinikanth fan and I always watch his films first day, first show at Aurora,’’ said the doctor, adding that both Rajini and his leading lady Aishwarya Rai have pledged their eyes. “We placed an order for these Tshirts two months ago,’’ said Baba APS, a member of the group. For most fans, the wait has been really long: Rajinikanth hasn’t had a release since Kuselan tanked at the box office in 2008. Many of them lined up outside the movie halls with pots of milk to perform ‘abhishekams’ for the highest paid actor in India, others came loaded with firecrackers to burst, the rest settled for ‘aarti’. What price a Rajini movie ticket? Fans would say priceless. Confirms A Anup, vice president (operations) of Fun cinemas in Bangalore, “Cinema halls have hiked ticket prices. Some single screens have increased the rate from Rs 70 to Rs 300, while multiplex ticket prices have jumped to Rs 500. Some multiplexes also sold tickets in the range of Rs 800 to Rs 1,500. With cent per cent collections across India, Enthiran (the Tamil version) is ready to break all records.